Pedro is almost 4 years old and has been diagnosed with spastic dipelgic cerebral palsy which means he is unable to stand or walk unaided. 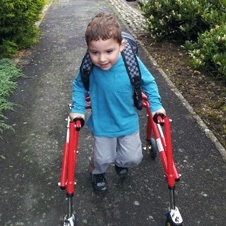 The Elifar Foundation has funded a specialised walker costing £600 which helps Pedro to improve his gait and postural alignment when practising his walking skills. It means he can explore his nursery and build the confidence to begin to take a few steps outside.